Cammock is a universal tripod shelf, designed to work with any tripod. Cammock provides a sturdy shelf to store gear, can be filled with heavy items to provide stabilization and can also be used as a camera rain cover or ground tarp. Cammock is made of sturdy, water-resistant fabric, and includes heavy duty attachment hardware as anchor points for attaching to tripods. Reflective accents make it easy to find in low light. It also includes a magnetic attach point which can be used with the Trek-Tech MagBag™ as a weight bag. 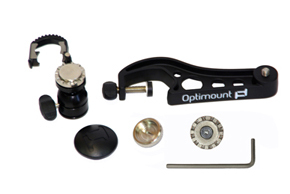 The OptiMount Kit will attach to the center tube of a TrekPod or a leg of any tripod. Our support parter ToCAD America has the replacement parts you may need for your Trek-Tech product.